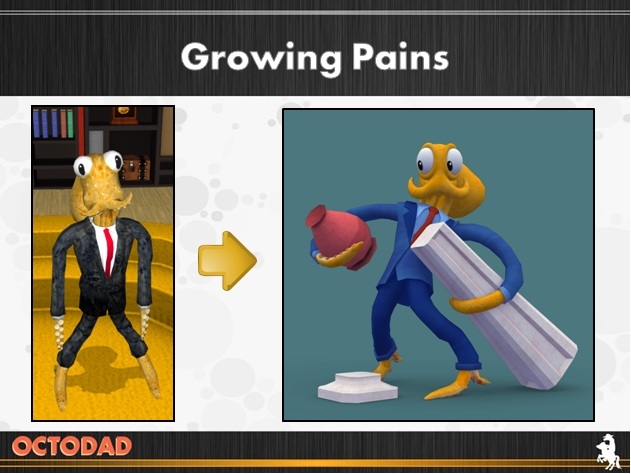 Now this brings us to today with Octodad: Dadliest Catch when we are once again preparing our little game for IndieCade submission on May 1st. We think that this year we’ve really upped our game so to speak and we’ve addressed many, if not all, of the issues that judges brought up with last year’s submission. Our goal is to have about three “levels” ready for submission so we can give a good representation of what we hope to have when the game is released later in 2013. We do already have one of those levels ready and another a good ways towards completion, so this leaves us with about a month or so to bring another level from prototype to fun. We’re holding our first playtest for the new new level this Thursday with a few people at DePaul University, but if you happen to be in the Chicago area make sure to drop by and try ’em out. You can check out the facebook event for the details.